As an eye specialist, we frequently come across cases of eye injuries which if were taken seriously in the earlier stages would have never progressed to forming a corneal ulcer. This article discusses all one needs to know about corneal ulcer. Corneal Ulcer also known as Ulcerative Keratitis is an inflammatory condition of the cornea (clear tissue in front of the eye) involving disturbance of its epithelial layer with the involvement of the corneal stroma. It presents as redness in the eye, pain in the eye, mild to severe eye discharge and reduced vision. 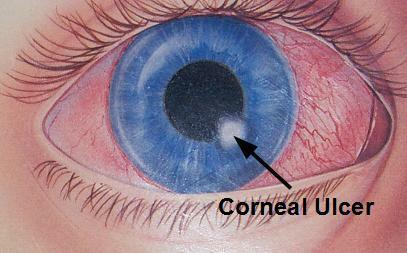 Most of the corneal Ulcer is caused by fungi, viruses, bacteria and protozoa. Canthamoeba keratitis: It is a rare eye disease in which amoeba invade the cornea of the eye, resulting in visual impairment or blindness. 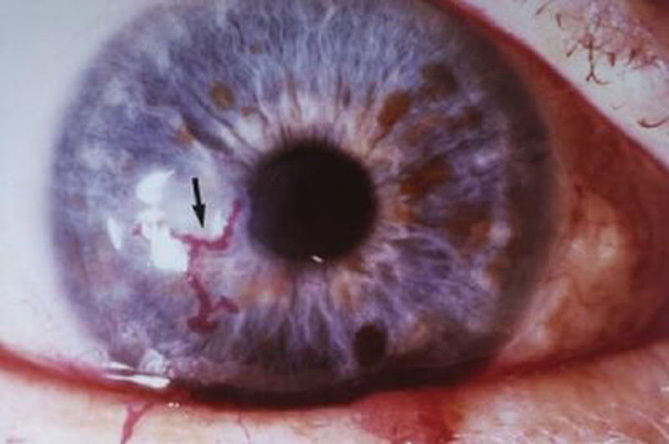 This infection occurs in people who frequently wear contact lenses. To prevent the condition, the contact lens must be properly disinfected before wearing. Herpes Simplex Keratitis: Herpes Simplex Keratitis is a viral infection of the eye caused by Herpes simplex virus. It is a viral infection that causes repeated flare ups which involve lesions or sores in the eye and if not treated leads to an ulcer in the eye. Therefore, make sure to complete the treatment of Herpes Simplex. B) Eye Injury: Injury to the eye resulting in abrasions or scratch to the cornea, if left untreated, leads to ulcer formation. Scratches, scrapes and cuts from fingernails, paper cuts, makeup brushes etc. 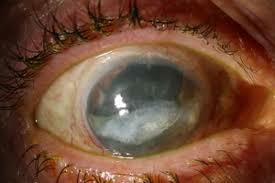 can become infected by bacteria and lead to corneal ulcers. C) Dry Eye Syndrome: Dry eyes develop when the eye is unable to maintain a healthy coating of the eye with the help of tears. In such cases, the eye is too dry to protect itself and this becomes a good base for the bacteria and fungi. Therefore, get an eye specialist’s opinion who would prescribe eye drops that help in lubricating the eyes and keeping them moist. This would prevent the ulcer formation. D) Vitamin A deficiency: People who have a dietary deficiency of Vitamin A are at risk of developing Corneal Ulcer. If one experiences the following symptoms; please set up an appointment with an eye specialist. · Pus-like discharge from the eyes. · Various eye drops are used to treat corneal ulcers. Antibiotics eye drops, Antifungal eye drops and Antiviral eye drops are the mainstay of treatment depending on the cause of the ulcer. · Anti-inflammatory eye drops are used to reduce the eye swelling. · If the corneal ulcers are deep and cannot be treated by eye drops and medication; surgery is mandatory to prevent vision loss. A Corneal Transplant can replace damaged cornea and restore vision. 1. Do not touch or rub your eyes with dirty hands. Aggressive rubbing of the eyes can damage the cornea causing a corneal ulcer. 2. Ensure that you are getting the daily recommended dose of Vitamins through your diet: Good nutrition plays an important role in maintaining healthy vision. 3. Wear protective eye glasses while working in industries, driving, and swimming. It protects the eyes from dust, the wind, chlorinated water from swimming pools etc. Welders must always wear a protective eye gear while welding and cutting. 4. Visit your Ophthalmologist for a regular eye examination. 5. Monitor and control your Diabetes and Hypertension. 6. Contact Lens Users must wash your hands each and every time you handle your lenses to avoid infection and not share their contact lenses with anyone. 7. Never sleep with contact lens in your eyes. 8. Store the lenses in disinfecting solutions overnight. 9. Discard and replace the contact lenses at the interval specified by your doctor.